Rosemont, Ontario straddles Highway 89 involving three townships, Mono Township, Mulmur Township and Adjala/Tosorontio Township. 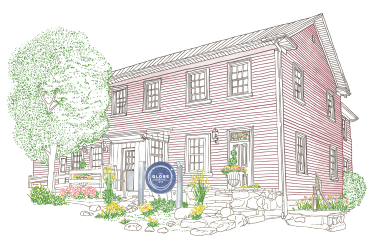 There are three businesses in Rosemont, The Globe Restaurant, Rosemont Hall and Rosemont General Store and Kitchen all owned and operated by the Rosemont Hospitality Group under the leadership of Janice and Earle O’Born. The Rosemont Hospitality Group employs experienced professionals including chefs, bakers and servers who have worked for many years in various parts of the local farming community. The O’Borns have been a part of the local community as they have a farm in Mono. 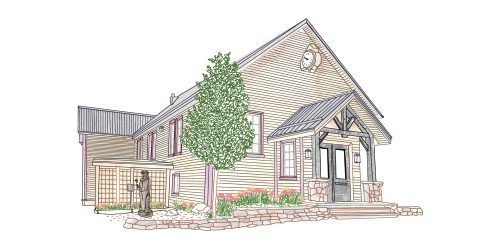 You could say that Earle and Janice have literally kept the charming historic hamlet of Rosemont on County Road 89 vibrant for future generations to enjoy. George or "Squire" Cummings came to the village of Rosemont in 1857 and purchased a parcel of land from Hugh Morrison that fronted Commercial Street (now Hwy 89). In 1861-62 George constructed the building, which would one day become the modern Rosemont General Store and Kitchen. George sold the building in 1886, and since then, it has gone through several owners. In 1945, James E. and Annie Q. Nicol purchased the building and ran a general store, known as Nicol's store. The Nicols sold the store 1950 and it passed through several more owners including Pam and Russell Stewart. In 2012 the Rosemont General Store was purchased by the current owners Janice and Earle O‘Born. It was essential to renovate and restore the building extensively. After being part of the Community for 33 years they created a project that would restore the Rosemont hamlet to its past glory. The main focus was to ensure everyone in the Community could enjoy the improvements. Also, they wanted to create sustainable employment within the Community. They started with the General Store, ensuring it was brought up to code. It was important to them to maintain the original character. The Store specializes in organic, locally sourced products, homemade pies, entrees, tea biscuits, bread, etc., and a wide selection of merchandise from the United Kingdom. There is a 30-seat café in the store and every effort was made to keep the original decor. The aroma of freshly prepared baked goods fills the air, with every item on the menu made from scratch. “One of the reasons we bought the store was so people in the community had somewhere to get their newspaper, their coffee and their OLG ticket,” Janice said. “It really has become a community hub.” The Kitchen is famous for its fresh homemade soups and entrées, including pizza cooked in the Woodstone oven. Catering can be booked for special events on the premises or in your chosen location. It also produces prepared foods to take away. The Globe serves the public at large and has been a meeting place for the residents of Rosemont and the surrounding areas. Once the Rosemont Hospitality Group had purchased the restaurant it was evident that it had be totally refurbished bringing it up to code. The first task was to make it wheel chair accessible on the ground level. This included the walkways, entrance and washrooms. The kitchen was completely demolished and rebuilt while the main floor dining room was opened up replacing all the windows to ensure they were environmentally efficient. Upstairs was renovated to include a library along with a 25 seat dining room and staff room. The basement was completely restored upgrading the heating, and water supply making a significant improvement environmentally. It was also the ideal time to construct a 30 seat outdoor patio for summer enjoyment. Beth continues to work for the Rosemont Hospitality Group combining her many skills with Executive Chef Jason Reiner. In keeping with The Globe’s tradition and with Beth’s help, Jason works closely with local farmers, foragers and ingredient suppliers to create cuisine from every food group that has regional, sustainable roots. Janice said the Store and The Globe provide unique products and services to the community in Dufferin County and our common ownership will ensure that our growing customer base is well served on both sides of the highway. Her sense of community is a core value and she is committed to making Rosemont a culinary destination that will encourage residents and visitors alike. Three years ago the Rosemont Hospitality Group purchased, what was known as The Loyal Orange Lodge, which had fallen into serious disrepair and made substantive renovations to the building and the parking areas. In 1885, the hall was put up for tender and an individual by the name of Mr. Tate donated a site for a new hall on the south side of what is now Highway 89. Moved by 1st committeeman, second by Bro. George Fletcher, “that this L.O.L. be adjourned until the stale cheese and biscuits of last meeting be consumed by a number of hungry individuals.” In 1928, a committee was appointed to determine the cost of repairing the old hall in which the Orangemen met. The building committee members consisted of Bros. E. Brett, F. Cumberland, A. Creary, Wm. Mitchell, and W.J. Little, who were appointed on December 6, 1929. Several special meetings were held, and it was finally decided to build a new hall with a full basement in Rosemont. They tore down their old lodges and used the best of the lumber to build their new hall, which still stands today. During the building of the hall, their lodge meetings were held in the Globe Hotel. Following the death of the King George in January 1936, no entertainment was allowed in the hall for a period of three months. In 1937, arrangements were made to have hydro installed, and the gasoline lamps were sold. Four years later, plans were made to install central heating with a pipeless furnace. In April of 1949, the shed was sold and a washroom and woodshed were constructed, attached to the east side of the hall. It was the hall that proved to be the biggest challenge — and perhaps the biggest achievement for the Rosemont Hospitality Group. “The hall hadn’t been loved in a while,” Janice said. “It was massive investment and a massive renovation. It took a year to do it.” Two bronze statues were commissioned from John Farrugia, a local sculptor and Director of the Craganrock Studio. “Mary” a woman from the 1800s, and “George” a farmer of the same period, when Rosemont thrived as stagecoach stop. “Mary” is installed outside The Rosemont Hall. “George” will be located outside The Globe. The hall welcomes groups that want to hold celebrations of life, graduations, wedding receptions and other events. The future is looking bright in Rosemont. When it became clear that a number of the houses in the community needed serious repairs, it was decided to continue restoration and improve other buildings in Rosemont, while maintaining an old style design. All houses are board and batten with tin roofs, painted in 19th century colours. 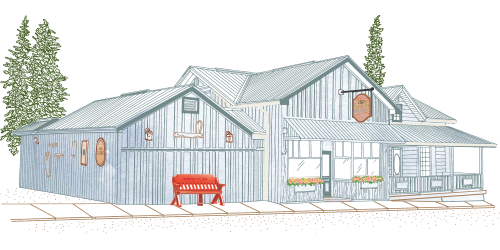 The restoration project is helping Rosemont transition from a humble rural community to a vibrant destination influenced by another passion of the O’Borns – the farm-to-table movement. Today, it’s their mission to help strengthen the region through sustainable employment, support of local businesses and establish a vibrant farm-to-table culture. They hope that Rosemont can become a destination to educate and introduce young and old to local foods and artisans so that people from far and wide can learn from and enjoy the community they call home.